Originally picked this recipe to use up courgettes and broad beans expected to arrive in our veg box. The courgettes never turned up, so were replaced with sliced mange tout. Easy and simple recipe, but what a faff risotto is with all that stirring. Meditative, my a**e, not with demanding children in the house. Still tasty, although I have to confess I was hungry a couple of hours later so perhaps better as a side dish rather than a main course. 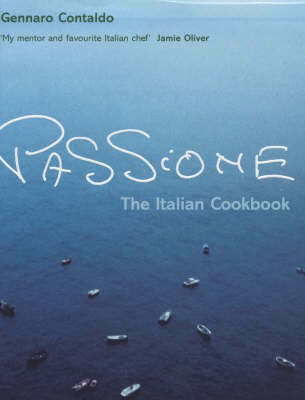 A beautiful collection of recipes that will bring Italy to your kitchen and home. Here are recipes that evoke Italian life at its most enticing. In this sumptuous cookbook, Gennaro Contaldo's passion for fresh, seasonal ingredients is shared with the enthusiasm for which he is famous. Born on Italy's Amalfi Coast, Gennaro later moved to London where he apprenticed with Antonio Carluccio. In 1999, he brought his love for food to bear on his own London restaurant, where he is still the first to arrive each morning. In Passione, he shares the secrets of good Italian cooking in recipes that include Spaghetti with Fava Beans, Cherry Tomatoes, and Goat's Cheese; Grilled Lamb Cutlets Stuffed with Prosciutto and Herbs; Duck Breasts in Limoncello; Salad of Raw Artichokes, Asparagus, and Fennel; and Fresh Mint Panna Cotta Drizzled with Honey. Buon appetito!